In July, San Francisco State University business administration student Matt Greenleaf found himself in a conference room in Lagos, Nigeria, with some of the country’s most successful businesspeople. CEOs from France and even French President Emmanuel Macron were there, as well. Had a globetrotting college student stumbled into an international economic forum by mistake? Not at all: Greenleaf was there as a participant, and the Nigerian and French heavy hitters on hand were happy to chat with him thanks to his ever-growing connections as a venture capitalist. “Almost everyone in that room was running one of the biggest companies in Nigeria or the biggest companies in France,” Greenleaf said. The Lagos business forum was just one stop on a summer fact-finding tour for Greenleaf. 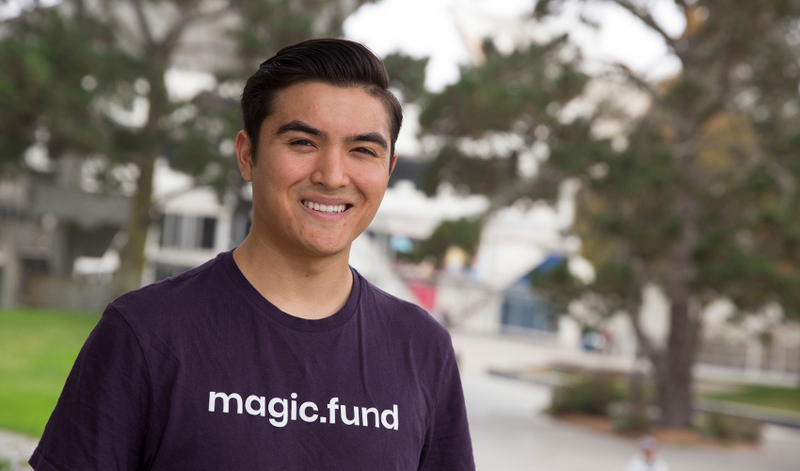 The SF State senior traveled to Europe and Africa to learn more about those regions’ startups as he expanded Magic Fund, the venture capital fund he founded with four partners in 2017. Through the multimillion dollar fund, Greenleaf has invested in a portfolio of 16 promising international companies in the early stages of their development. “We want to accelerate the growth and impact of startups in emerging markets to solve large-scale issues in their countries,” Greenleaf said. For instance, the fund invested in PAYFAZZ, a mobile banking startup in Indonesia, and Kiwi Campus, a company developed by Colombian students at the University of California, Berkeley to build and operate autonomous food-delivery robots. Greenleaf and his partners are able to discover, evaluate and invest in companies like these through connections with other local and international entrepreneurs. That network also helps Magic Fund connect the founders of these startups to other global opportunities. Next Greenleaf hopes to expand the fund’s investments in Africa and Southeast Asia, two emerging markets he and his partners see as having big potential for startups to provide novel services. “These regions are going to be a really big part of the future of the world economy,” he said.